The LDAP Binding user is created to allow the application to gain access the LDAP directory in order to facilitate authentication requests when a regular LDAP user is attempting to login. JumpCloud does not support anonymous binds. When a user is designated as the Bind DN, they are automatically bound to the JumpCloud LDAP directory. It's not required that this user be a 'service account'. 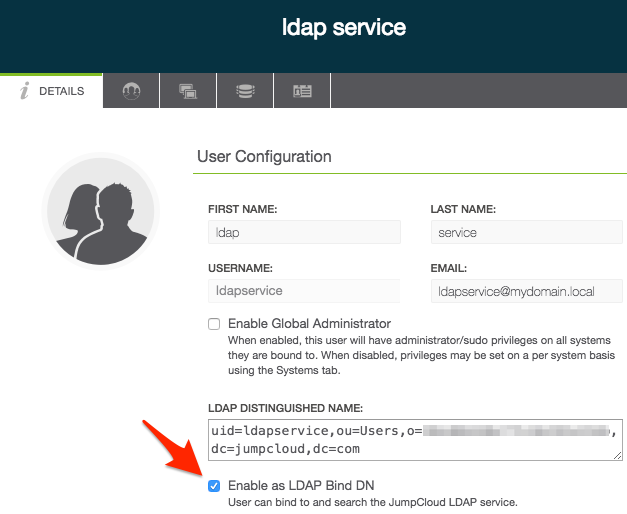 Any JumpCloud user can be set as a binding user, although it's generally recommended to treat this account as privileged for use only to facilitate the applications ability to bind/search the LDAP directory. This option does NOT grant users access to LDAP, to grant access, see Binding Users to Resources. More than one user may be designated as an LDAP Binding User, some applications require this designation for all users of the application. This can be the case if the Bind DN is able to login, but others cannot even though they are bound to the LDAP directory. The LDAP Binding User can be excluded from password expiration policy by selecting PASSWORD NEVER EXPIRES. All other password policies are global and will apply. In order to authenticate via LDAP, users must be granted access to the JumpCloud LDAP directory, either individually or via a group. See Creating LDAP Groups and Binding Users to Resources. The LDAP DN value is found in the user details (See above screenshot). Your application may not have a field called LDAP Distinguished Name, it may be referred to as the BindDN or may only have a 'username' field paired with a password. This is the correct value for that field. The BaseDN may also be referred to as SearchDN, Search Base or other similar terminology. LDAP service is Read-Only. As a result, ldapmodify and ldapadd are currently unsupported. Any modifications to LDAP users will require the use of either the JumpCloud web console or our JumpCloud API. Note: LDAP applications typically authenticate against uid, which is the JumpCloud username, not the full email address. ldapsearch -H ldap://ldap.jumpcloud.com:389 -ZZ -x -b "ou=Users,o=YOUR_ORG_ID,dc=jumpcloud,dc=com" -D "uid=LDAP_BINDING_USER,ou=Users,o=YOUR_ORG_ID,dc=jumpcloud,dc=com" -W "(objectClass=inetOrgPerson)"
For basic testing, on Linux or OS X, this menu-driven script leverages ldapsearch. Download here. Click here for more information about JumpCloud User Attributes.